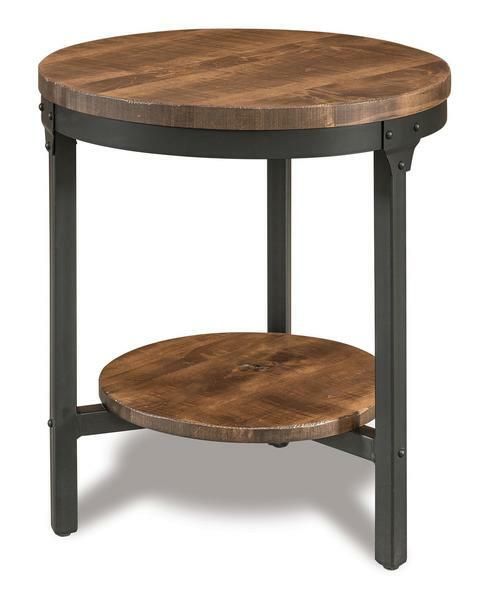 Meet our Amish Houston 22" Round End Table with Shelf. Made from rough sawn lumber to give the look of barn wood, a round 1 1/8 inch thick top sits upon a steel, power-coated base. Only available in rough sawn rustic brown maple, it can be finished in several stains including harvest, antique slate, rich cherry and rich tobacco (shown in almond with low sheen varnish).